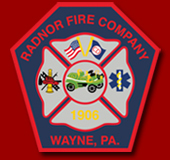 Radnor Fire Company was dispatched to the unit block of Briar Rd. in Tredyffrin Township at 1908 hours on Monday, June 4, just as regular Monday drill was getting underway at RFC. The company was dispatched to the above location for a carbon monoxide alarm reported from Chester County on a transfer to Delaware County. No one was reported sick in the residence. Radnor Fire Company arrived to find the residents evacuated with the exception of a HVAC company working in the basement. The family was in the yard across the street. Radnor's chiefs spoke with the homeowner, who stated that she was having her HVAC system replaced and her basement non-digital, CO alarm was going off. Radnor Fire crews entered the structure wearing full PPE to extricate the workers until the fire company could figure out the problem. Crews found CO readings in the basement at over 200 ppm with the 1st floor at 5 ppm, and the 2nd floor at 0 ppm. The dryer was electric, and the hot water heater was gas and turned off. PECO was called to the scene to assist in finding the leak. After an extensive search and tests, it was determined that the CO leak was coming from the acetylene tank that the HVAC company was using for instillation. Radnor Fire crews removed the tank from the residence, and the hot water heater was turned back on and operating normally. The tank was checked by PECO to confirm the leak. PECO and Radnor Fire crews checked the residence prior to leaving and no traces of CO were present in the home after ventilation. All readings were 0 ppm on all floors. Radnor crews were made available after 8 p.m.